A while ago, I built a precision voltage adapter using LMP8358. In this post, I will show you a similar precision voltage adapter built using a Linear Technology‘s LTC1100. 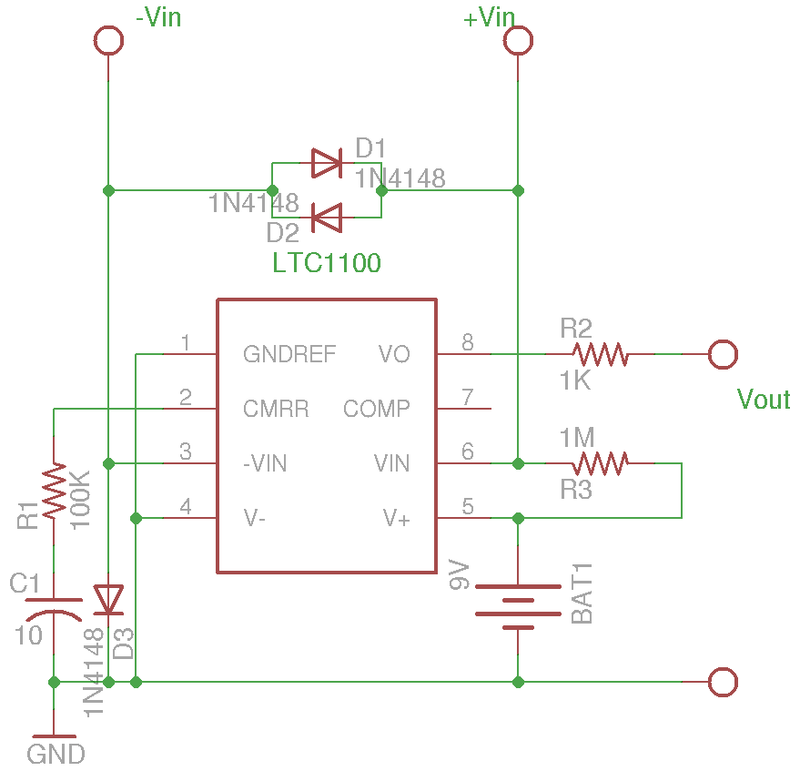 LTC1100 is a zero-drift, precision instrumentation amplifier. Unlike LMP8358, it does not offer programmatic gain setting (the 8-pin package), and the gain is preset at 100. But LTC1100 has several advantages over LMP8358. For instance, while the typical gain non-linearity for LT1100 and LMP8358 are quite comparable, the guaranteed maximum gain nonlinearity for LTC1100 is 20ppm compared to 100ppm for LMP8358. LTC1100’s also has superior gain accuracy and wider supply voltage range, making it an ideal candidate for precision voltage measurements. On the other hand, LTC1100’s GBW is significantly less than that of LMP8358, and the CMRR (common mode rejection ratio) is also worse. 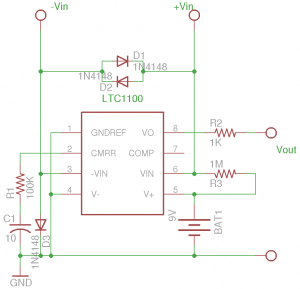 However, for measuring DC-level voltages, gain linearity and accuracy are far more important. D1 and D2 protect the differential inputs. D3 is used to bias negative input above ground since we are using a single power supply here. R3 provides a return path for the input bias current. 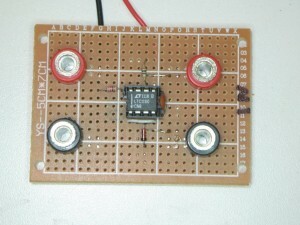 The whole circuit can be conveniently powered via a 9V battery. Here is a picture of the build. 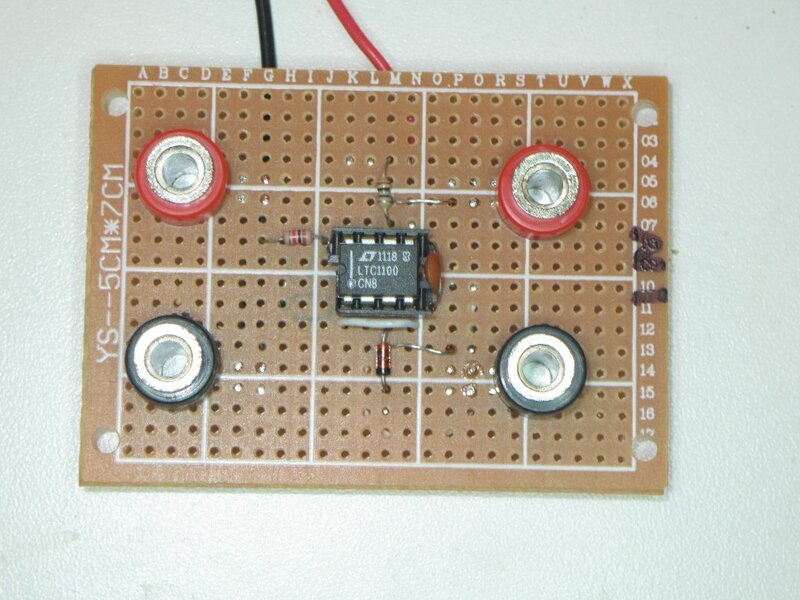 Using this circuit, you can measure voltages down to the micro-volt range.